Brazil’s two largest domestic airlines – GOL and LATAM Airlines Brazil – have reasonably solid outlooks for their performance in the country during 2019 as the country marches toward an economic recovery. Uncertainty remains over the fate of Brazil’s fourth largest airline, Avianca Brazil. The airline sought bankruptcy protection in late 2018, and recently Brazil’s third largest airline Azul stated that it had entered a non-binding agreement to acquire some of Avianca Brazil’s assets – aircraft and slots at some of Brazil’s key airports. If those plans materialise, capacity rationalisation should be maintained in Brazil’s domestic market; however GOL and LATAM could find a formidable competitor in some key airports in Brazil. Azul has a track record of making opportunistic acquisitions to accelerate its position in Brazil’s domestic market – the largest in Latin America. 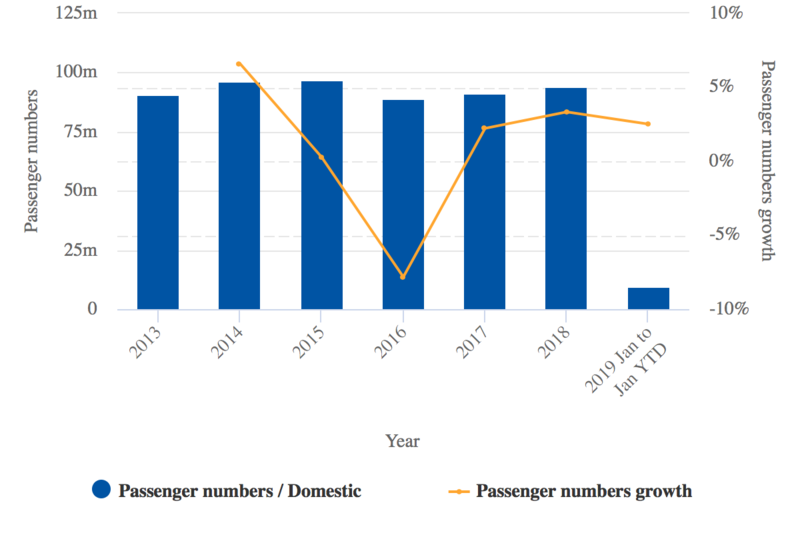 Brazil should log solid domestic passenger growth in 2019 as GDP is projected to climb above 2%. 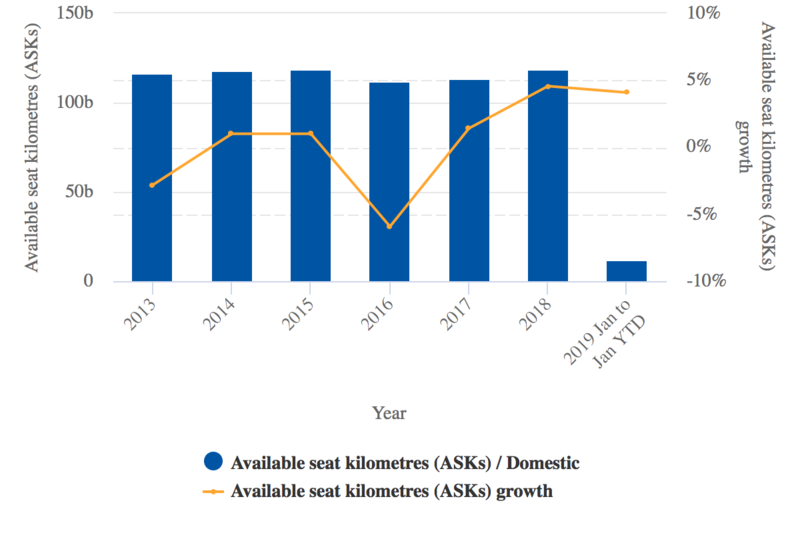 Capacity rationalisation is key to maintaining a growth trajectory to reach the domestic passenger levels that Brazil recorded in 2014 and 2015. Azul’s proposed takeover of Avianca Brazil’s assets should not upset the capacity-demand balance in the domestic market. In 2018 Brazil posted 3.3% growth year-on-year in domestic passenger numbers, compared with an increase of 2% in 2017 and negative growth of 7.8% in 2016. Nearly 94 million passengers travelled in Brazil’s domestic market in 2018, which was still below the 96 million recorded in 2015 before the country’s recession hit its low point. Source: CAPA - Centre for Aviation and Brazil ANAC. The country’s tepid GDP growth of 1.1% in 2018 was largely driven by a truckers' strike and uncertainty over Presidential elections in Brazil. Its new President, Jair Bolsonaro, is largely viewed as business-friendly, and Azul has stated that the new administration appears to be taking all the right steps to promote the economic development of the country. Recently, GOL’s executives remarked that Brazil’s Central Bank was forecasting 2.5% GDP growth in 2019, and ABEAR, the association of Brazil’s airlines, estimates domestic air travel demand should grow 5% to 7%. GOL’s domestic traffic grew 3.1% in 2018 and load factors notched up 0.6ppts, to 80.8%. Its average fares increased 8% year-on-year and yields increased 7.7%. Brazil did face currency pressure in 2018, but the fluctuations largely affected international demand to North America and Europe. Both GOL and LATAM Airlines Brazil had reasonably positive views of Brazil’s domestic market at the end of 2018, and those views appear to be holding steady into early 2019. GOL’s management has concluded that “business activities” were up year-on-year in late 2018 and early 2019, which was sustaining higher yields in the domestic markets. Additionally, the Carnival holiday was in Mar-2019 versus Feb-2018, which was positive for extending the the summer travel season in the country. Both GOL and LATAM Airlines Group have highlighted a certain level of capacity rationalisation in Brazil’s domestic market. Data from the Brazilian regulator ANAC show that domestic ASKs grew 4% year-on-year in Jan-2019. GOL has forecast that its domestic capacity will increase 2% to 4% in 2019, and LATAM Airlines Brazil expects its domestic ASKs to grow in the same range for the year. Azul is forecasting 16% to 18% domestic capacity growth. LATAM, which posted a 10.2% increase in domestic Brazil unit revenues in 4Q2018 (denominated in BRL, the result was a 6.2% decrease denominated in the USD), recently concluded that there are good trends in Brazil’s domestic market. However, “we believe that capacity discipline is very important to the market”, company executives recently stated. Data from Brazil’s ANAC and CAPA show that 2018 was the first year that Brazil’s domestic ASKs had increased above 1% since 2014. ASKs fell approximately 6% year-on-year in 2016 during a two-year recession in the country that began to wane in 2017. In Dec-2018, Brazil’s fourth largest airline, Avianca Brazil, sought bankruptcy protection as lessors threatened to repossess the airline’s aircraft. Data from ANAC show that Avianca Brazil’s domestic traffic share fell to 11% to 12.9% in Jan-2019, and its ASKs fell 7.2% year-on-year. Azul has forged a non-binding agreement to acquire significant assets of Avianca Brazil, including 30 Airbus 320 jets and 70 airport slots for USD105 million. The Rio Times has reported that the deal could allow Azul to bolster its slots at the close-in, high-yielding domestic airport São Paulo/Congonhas airport, which would be a positive strategic development for the airline (it will also gain slots at other airports if the deal is approved). 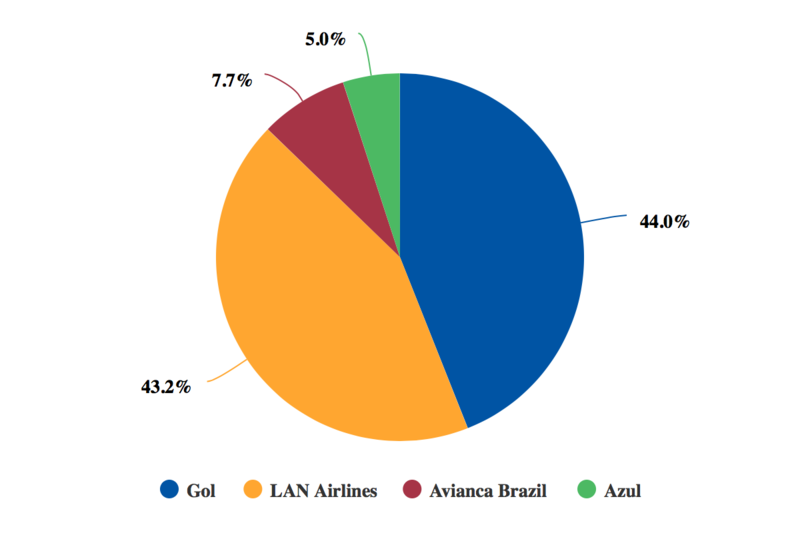 Data from CAPA and OAG show that presently (as of mid-Mar-2019) Azul accounts for 5% of departing frequencies at the airport. Azul is also reportedly hoping to gain slots at São Paulo Guarulhos and Rio de Janeiro Santo Dumont. Azul’s 16% to 18% capacity growth in 2019 includes some A320s that Avianca Brazil has already disposed of as part of its transformation plan, Azul executives recently explained. The company’s management stressed that it expected capacity rationalisation to remain intact if the proposed deal to acquire Avianca Brazil’s assets was finalised. It is a logical assumption, given that it is largely a transfer of assets designed to bolster Azul’s position in the domestic market. When Azul announced plans to purchase the regional Brazilian airline TRIP in 2012, Azul’s domestic market share was approximately 10%, and TRIP had a 4% share. The acquisition allowed Azul to obtain a higher share than it could have done through pure organic growth. Essentially, the acquisition of TRIP accelerated Azul’s growth by broadly four years. Even as Azul believes its pursuit of Avianca Brazil’s assets will not materially affect the capacity balance in Brazil’s domestic market, in key markets GOL and LATAM will face a more formidable competitor with a more solid financial footing. Azul is marking more than a decade in service, and in that short period of time has been opportunistic in acquiring TRIP to bolster its position in Latin America’s largest aviation market.